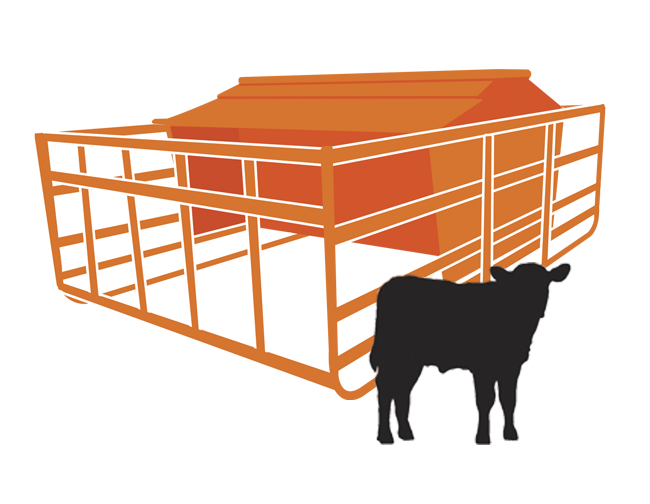 Now marks the time when cattle producers should begin thinking about creep feed supplementation for nursing calves. The milk from a lactating beef cow only furnishes about 50 percent of the nutrients that a 3-4 month-old calf needs to realize its genetic potential for growth. Although creep feeding is extremely beneficial when high-quality pasture is inadequate or unavailable, research shows that supplemental creep, regardless of pasture quality, pays dividends come weaning time. BioZyme brand VitaFerm® offers three products (Sure Champ®, Sure Power 37™ and Sure Start Pellet®) that can be incorporated with feedstuffs found at the local mill to create a complete ration, and an additional product (Amaferm® Digest More™) that can be incorporated into any pre-formulated/bagged creep feed. Sure Power 37™ – A high protein and macro mineral pellet that is a great fit for building today’s modern creep feeds. Contains moderate levels of essential micronutrients to ensure animal performance. Sure Power 37 can be used alone for commercial calf creeps or together with Sure Champ to build high-performance show and creep rations. For more information about Sure Power 37, visit vitaferm.com/products/sure-power-37. Sure Champ® – Proven in the show ring, Sure Champ works equally as well in creep feed to help maintain the strong appetite and healthy digestive system needed to unlock the genetic potential of calves. Sure Champ contains high levels of essential micronutrients for that extra bloom that show and sale cattle require. For more information about Sure Champ, visit surechamp.com/products/sure-champ-cattle/. Sure Start Pellet® – The ideal supplement for stressed calves during weaning. This pellet also works extremely well as a creep balancer, bringing high levels of vitamins and minerals when additional protein is not needed. Sure Start Pellet works well in distillers and corn gluten-based creep feeds. For more information about Sure Start, visit vitaferm.com/products/vitaferm-sure-start-pellet. Digest More™ – A low inclusion way to supplement Amaferm in any diet. At the feeding rate of 0.5 ounces, Digest More provides 2 grams of Amaferm. Digest More is best suited when additional protein, vitamins and minerals are not required. For more information about Digest More, visit vitaferm.com/products/digest-more. Producers can view creep feed rations using these products developed by BioZyme’s nutritionist team by visiting http://static.backofficeapps.com/biozyme/pdfs/literature/VF+CreepFeed.pdf. BioZyme customer Kevin Eathington of Eathington Angus in Illinois has witnessed positive gains in his calves by supplementing his creep feed with Digest More. As a free service to beef producers, BioZyme’s nutritionists will also formulate custom creep feed recipes based on a producer’s available ingredients and specific production phase requirements. To access this free service, producers are encouraged to contact their BioZyme Area Sales Manager http://www.biozymeinc.com/our-staff or call 800-821-3070 to begin the process.